Seven days into the new year and mine is starting off slowly. During the holidays I took some much needed time away from the computer and website work. Whilst I really enjoyed it now I am finding it hard getting back to the same pace I had before the holidays. Anyone else feeling this way? The rainy gloomy weather isn’t helping either. These past few days all I’ve wanted to do is sit under a warm blanket with a good book, a cup of coffee and eat warm comforting meals. But those so-called “comforting” meals can quickly turn bad and end up as comforting yet bad fatty food choices with little nutrition all for the sake of a quick meal. Days when I feel like this it can be a struggle to shake off and prepare a healthy and nutritious dinner or lunch. 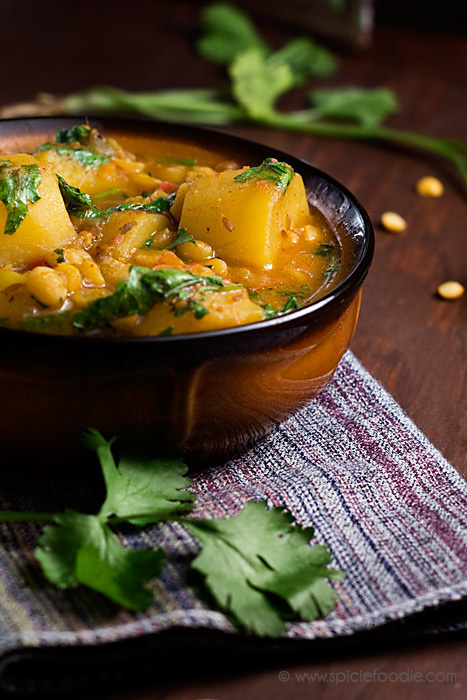 This potato and yellow split pea curry is a great meal for those lazy days. 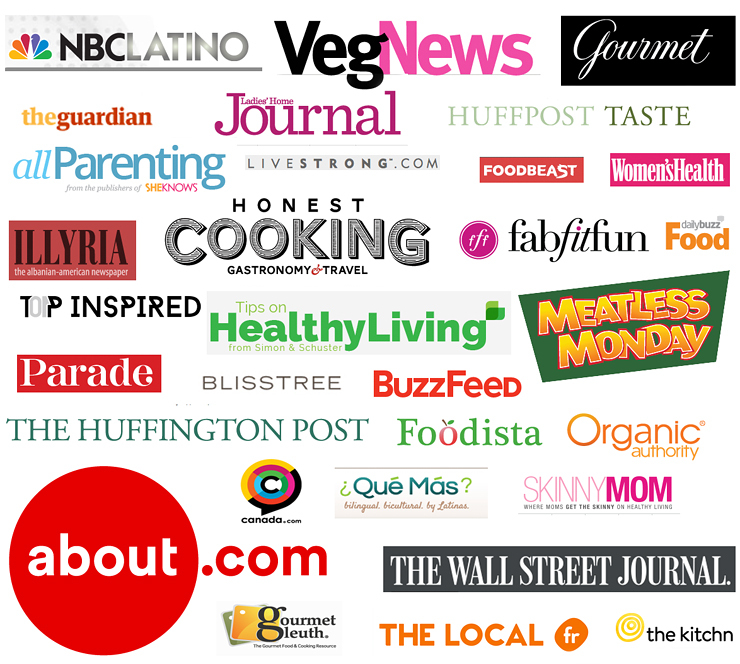 It not only takes very little effort but it is also full of healthy ingredients. Plus it is a one pot/pan meal so minimal clean up is required. Let me show you how I made it then we’ll talk health benefits. 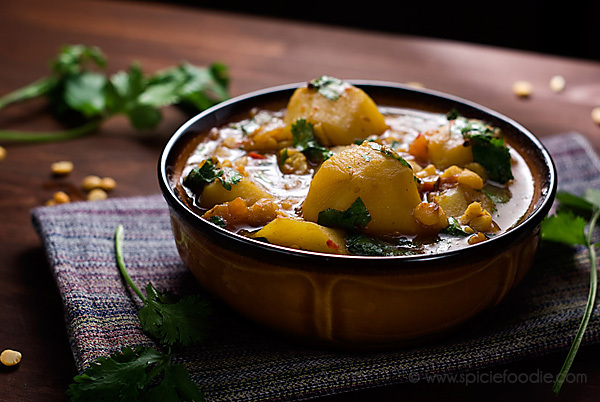 Potato and Yellow Split Pea Curry Recipe. 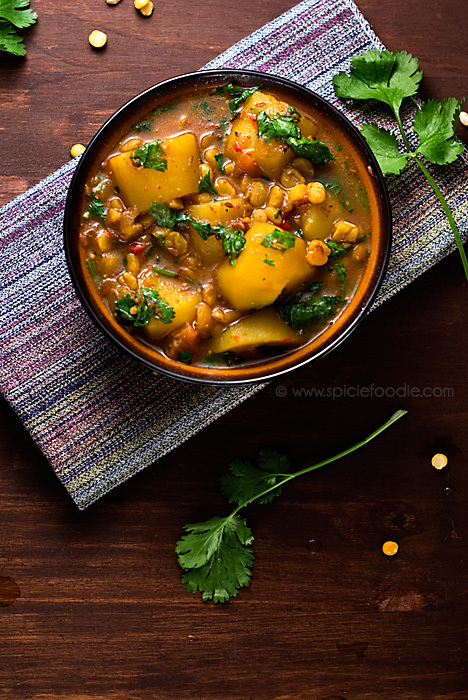 A fast and hassle free meal perfect for Meatless Mondays.Reap the health benefits of dried yellow split peas with this curry. Pick through and rinse the split peas, set aside and allow to drain. Heat the oil and once warm saute the onion until soft and translucent. Next add ginger and garlic and saute for 2 minutes. Then add all of the spices, curry leaves and chile, cook until the spices begin to pop making sure to stir and prevent burning. Add the potatoes, tomato, split peas, and water/stock. Stir well, cover and simmer until the split peas and potatoes have soften or about 30-40 minutes. Taste and adjust seasoning if needed. Mix in chopped cilantro right before serving. Serve with steamed basmati rice and steamed broccoli if desired. I served our curry with steamed Basmati rice (Indian Rice ) and freshly steamed broccoli. I love grinding and using my homemade Garam Masala but you can of course use store bought, like this one I’ve used before. Now let’s talk health benefits. Split peas (yellow or green) are among one of the natural food sources with the highest amount of fiber. The benefits of this high fiber is not only to the digestive system but also to our waist line. Foods high in fiber leave us satiated and full, which means you’ll not only eat less but feel quite satisfied too. Yellow split peas are high in folate, a good source of zinc, provide choline, niacin and pantothenic acid. Additionally they are low in fat and a great source of vegetarian protein. And even though they are a carb they will not spike your blood sugar. Regardless of all the health benefits it is also a great meal to fall back on. It really comes in handy on both lazy and busy days. I hope you give it a try and enjoy it as much as we do. Thanks for stopping by and have a great week! Thank you and I hope you enjoy it soon! Nothing beats a dish that is simple to prepare, delicious and healthy. Gold star for you Nancy!! This healthy, comforting curry would be just the thing I need to get me going. Happy New Year, Nancy! Thanks Jean and I hope 2013 has started off great for you! Quite a droolworthy curry, such atis. wonderful combo..Excellent side dish for rice or rotis. It’s windy, cloudy and grey here – I could use a bowl of that for lunch! A perfect dish for that weather Alyssa. What a gorgeous and delicious looking curry! Thanks Ala for the recommendation I’ll check it out soon. Yellow curry is my absolute favorite! This looks wonderful, can’t wait to try it! this looks so hearty and delicious! the perfect meal for a cold winter’s night. 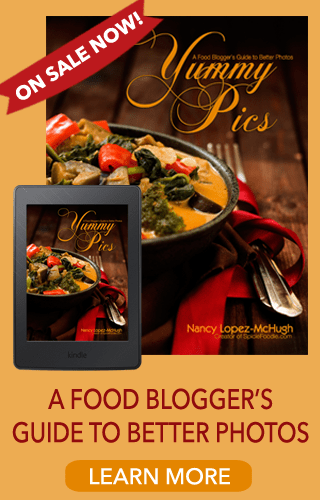 Delicious curry dish…I think I would devour the whole bowl of it…the pictures are so beautiful Nancy. Thank you Juliana and a Happy New Year to you too! I can imagine it would be hard to get motivated when it’s cold and raining outside. Fortunately I don’t have that problem and since I have just had two weeks holiday from work, I have been able to completely change up my blog and now feel quite motivated. But the sunshine helps heaps. That’s great and glad it is going well for you Suzanne. I need some sunshine to get me motivated. Thanks Kiersten and I hope you do soon. A lovely warming dish I could easily eat without any accompaniments at all ! Loved the photography also: well, when don’t I on this blog 🙂 ! Never heard of Indian red chile. Any substitute? Hi Kristi, Agh this grey dark days. I can’t wait for spring! I hear you. I took about 10 days off but my kids being off from school is actually more work for me and I am not sure if I had rest… lol. Now it’s time to catch up but it’s been a little hard. The cold weather, being sick, and lack of motivation (and it’s beginning of year too!). Hope we can cheer up each other. Well you did with this delicious looking curry! 😉 I remember you said you love potatoes. Me too and so happy seeing a big chunk in this curry. We are all curry lovers here at home but my repertoire is quite limited. This recipe is so apt for now when we have all overdosed on meat in the holidays. Lovely dish, Nancy. 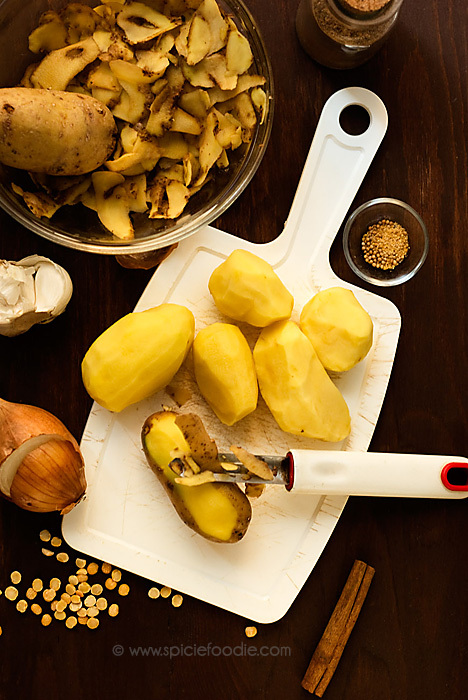 We too love our curry and it can be a challenge keeping things fresh sometimes. That’s when you have to experiment. Thank Adora! It would be perfect with some brown rice Ramona. I hope you are all feeling better now. Thanks! HI, your curry sure look very tempting and awesome. Excellent pictures, very well taken and lovely presentation. Nice to eat with french loaf. What a great soup! I just love soups during the colder months. This looks great my dear! It got so cold last week that I did sit around with a cup of hot tea or soup and read a good book! What a way to spend time off! This curry warms me up just looking at it. I can taste it and smell it looking at those beautiful pictures! This looks seriously good. Bring on meatless mondays. As you said, a perfect recipe for a lazy day. And comforting as well. Just made this and had to let you know how delicious it is! Wonderful. Thanks! I am still having a heard time getting back in the swing of things 🙂 But this dish might help….gorgeous with such beautiful flavors! Thank you for the recipe! 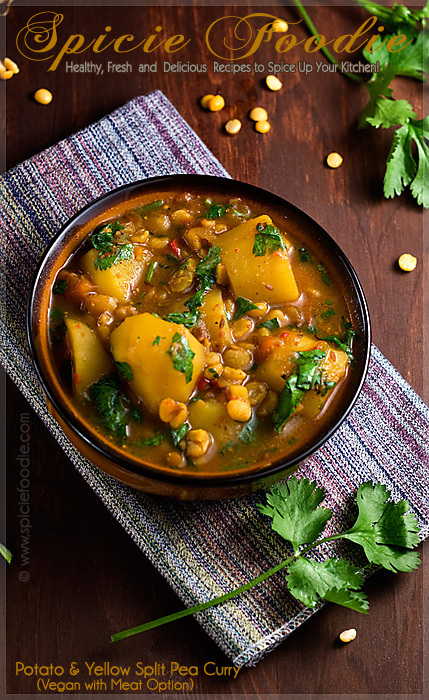 I was looking for a yellow split peas recipe and I will try yours now because looks great! Thank you Alvaro and enjoy the curry! Third time that i have cooked and enjoyed this receipe, it is now a firm family fave, made from everything you should have in the store cupboard!! well done you! Thank you and I’m thrilled that you family enjoys this curry as much as we do. I am confused. In the health benefits section you refer to cilantro, but the recipe does not contain this ingredient. Was there an omission in the recipe? Thank you for catching that, cilantro can be mixed in right before serving. Enjoy the curry! Thank you Angie, glad to hear it! My Dog is a Junkie!